Can you tell us briefly about your career and ECTA? The European Chemical Transport Agency (ECTA) was founded 17 years ago due to demand from the European Petrochemical Association (EPCA) to have a singular, united voice for the chemical Logistics Service Providers (LSP’s). 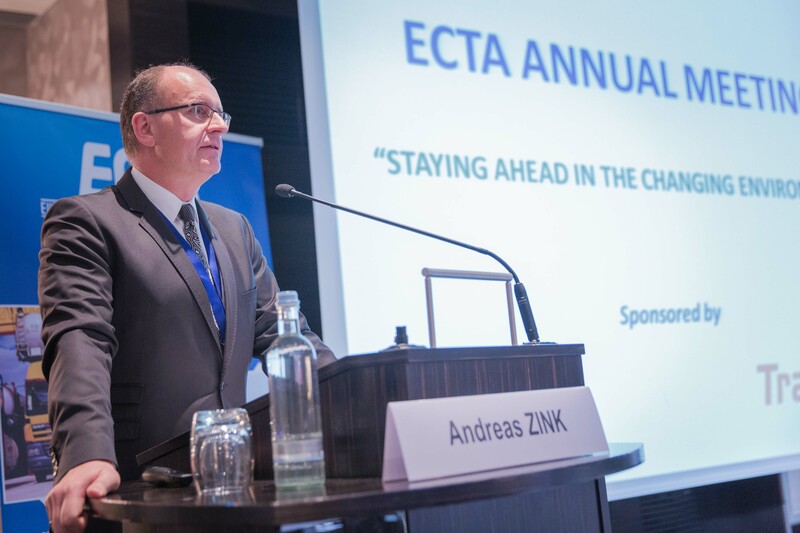 Since then ECTA has separated from EPCA and become an independent entity, but still maintains links and interaction with EPCA and a great deal of involvement with the European Chemical Industry Council (CEFIC). The purpose of ECTA is to provide a voice for the chemical transport industry, development of best practice guidelines and support a sustainable future for their members and the industry. ECTA consists of an MD and an Administration Manager as the only paid positions and the rest of the board is completely voluntary. I became a member of the ECTA board initially in 2002 following the retirement of one of my colleagues from LKW Walter and have now been President for 4 years. LKW Walter were one of the founding members and there’s always been a strong encouragement from the company to support ECTA. Tell us about the transition from EPCA to the independent ECTA, was that a difficult journey? Well of course, there were difficulties at the start, there always is when a child first leaves their parents! The issue was that EPCA is primarily a networking forum and ECTA developed out of that remit into more of a European voice for logistics as it is now today and so we had to make the separation. However, from what started as a handful of founding members we can now say that 80% of Chemicals transported in Europe today are done so by one of the 102 members of ECTA. This is now our 17th annual meeting with attendance growing again from last year to over 120 participants including non-member service companies and representatives from the chemical manufacturers. Whilst we have been financially independent from EPCA since 2008 with the transition starting in 2006, we still share an office with EPCA and maintain open lines of communication. The relationship we have with CEFIC is very productive in that there is an open exchange of information both ways with any queries we may have. We have a very open minded collaboration, always involving them in discussions and working groups that ECTA host as we feel that there is no point in having these conversations without involving the industry which it concerns. With these working groups we have what we consider a great contribution from our members with 35% actively becoming involved to shape the decisions and direction which ECTA takes. This is key to ensuring that we are truly representing the industry. Bulk Distributor last interviewed you not long after you became president, nearly 3 years ago now. What have you achieved in this time? The main development since 2009 has been the Responsible Care (RC) program with guidance from CEFIC. This was the first Europe-wide implementation of this scheme for the transport industry, with all previous iterations taking place on a national level. This wouldn’t have worked for ECTA, however, due to our members having offices all over Europe so we needed a standard which all of their sites strive to. We initially had 9 companies involved with this and with CEFIC’s assistance we were able to implement the program and influence national chemical bodies. After 2011 we really started to see the effects of the program due to the number of members involved reaching a critical mass and becoming statistically significant. Now with 59 companies involved with RC, we can see from the key performance indicators provided by all of our members that the number of unloading incidents has steadily decreased with both chemical manufacturers and their customers over the last 3 years. The KPIs which we use measure incidents, accidents and driver training across different aspects of the logistics process. Can you tell us more about the purpose of the responsible care program? The RC initiative is owned by CEFIC and its purpose is to provide a rigorous assessment of companies aimed to continuously improve the environmental, health and safety performance of members. The KPIs form a key part of this as you can’t manage what you don’t measure. Another integral part of the program is the improvement plan which all members sign up to, meaning a commitment from all members to strive to be better. The initial stage of an RC application by ECTA would be to go through the applicants SQAS assessment in detail to confirm compliance with 59 R C questions, all of which must be answered positively in order to be R C approved. They then sign an agreement to commit to the terms set out by the program and begin providing the KPIs we require an annual R C improvement plan. ECTA consolidates all of the KPI figures and improvement plans to ensure anonymity of members and publishes the results publically. What if someone doesn’t pass the initial qualifying questionnaire? Is that it for them as far as involvement in RC goes? Of course not, we don’t aim to exclude companies! If an applicant doesn’t qualify ECTA will help and guide them to become better performing in HSSEQ. This is the benefit of joining ECTA – access to our collective best practice guidelines and support. What has been the most difficult challenge for ECTA in implementing this program? Besides the initial issue of getting enough companies involved so that our statistics became significant and meaningful, the biggest challenge is that there is currently no recognition of RC with the chemical manufacturers and they aren’t really aware of what RC is all about. Most companies ask if a service provider has ISO and SQAS accreditation and then tick the yes box but don’t really look into the assessments, and I think this is the same for RC currently. Only one manufacturer in Europe presently requests to see the RC assessment in order to approve service providers. In order to get the buy in from chemical companies I believe they need further information on what RC is and what we at ECTA are striving for. We hope that once the industry comes on board that they will start making RC a requirement from their service providers and the wider industry will see the results that ECTA have witnessed. Another potential issue is that a lot of the players in the European market are also dealing all over the world. One big victory for us is that the Gulf Petrochemical & Chemicals association (GPCA) has announced, as you will hear in a presentation later today, that they are to use SQAS assessments with establishment of an SQAS committee and qualified auditors. This will ultimately lead them to RC, although it is not an instant progression, and will help members have standardisation across both Europe and the Gulf region. How does the future of ECTA look? The future is positive, before RC we only had a clue as what was needed to develop best practice, but now we have statistics which show there is still room for improvement and need for, I don’t like the word regulation, standardisation. As I said, you can’t manage what you don’t measure, and we all talk about needing to improve CO2 reductions, now we can measure and influence this. We can further influence this be using more intermodal transport, and the progressive improvement of engine efficiency is an inevitability which will lower emissions. Due to the R C program the transport industry can be more transparent and can therefore react to questions from the chemical industry and public better. The chemical industry has a bad public image due to the impression of it being dirty and dangerous. For example, if a truck transporting pampas unfortunately has an accident; it will be unlikely to receive publicity. However, if the truck is transporting an absorber, which is 80% pampas, it will be treated as “another danger from the chemical industry” by the media. By publishing these statistics we can help negate this public image, increase public awareness and show that we are constantly improving. We will finish the interview where we started – you have now been president for 4 years Andreas, with the developments and challenges they will bring, do you see yourself wanting to remain president for the next 4 years? Well, they haven’t found anyone else willing to volunteer yet so… (laughing) No, I am very happy to carry on for another 4 years and excited about what the future will bring. Everything is decided with the board who are all volunteers and do this out of their own time, so I don’t have too much individual responsibility. From the perspective of a member, LKW Walter definitely sees the value of ECTA, if we didn’t we wouldn’t invest our time and money in membership. I am glad to be contributing to such a positive future, and hope that ECTA continues to grow and develop, perhaps from some of the new service companies here at our 17th annual meeting today! This entry was posted in Equipment & Technology, Feature Interviews, Logistics. You can post a comment.